No stranger to a blue super-suit, Superman himself, Henry Cavill, eschewed the red pants on this occasion for something more tailored. The blue on the jacket is so electric it’s shocked us into static, but Cavill works it with a black shirt and trousers to make the colour pop. No-break suit trousers are working well this year, and for a man with Cavill’s shoulder boulders, a generous fit on the jacket is the way to go. Stan is making near-constant appearances on our list since the juggernaut Avengers: Infinity War publicity machine rolled into action a millennia ago. It’s hard to play a checked grey suit casually, your best bet being to leave it alone to do its thing with a white tee or a luxe cashmere or merino wool jumper. If you go the knitwear route take you cue from Stan with a tonal shade. A former soloist with the Royal Ballet, Eric Underwood would, unbelievably, have to paint his own ballet shoes black to match his skin colour, such was the lack of diversity in the industry. 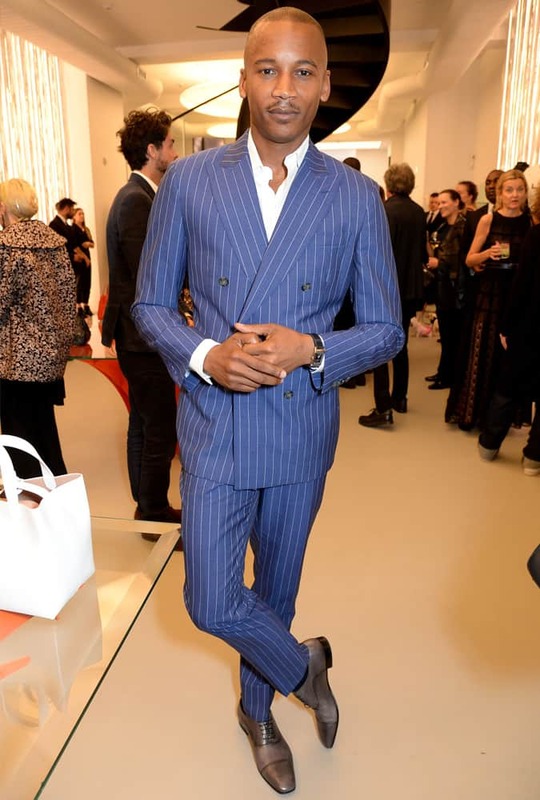 Out of the leotard, Underwood looks as elegant as you would expect in a natty double-breasted pinstripe suit from Hackett. With most Hollywood stars having a team of stylists behind them, pushing and preening them into a collection of safe suits and jaded jackets, it’s actually rare to see a daring style move on the red carpet. 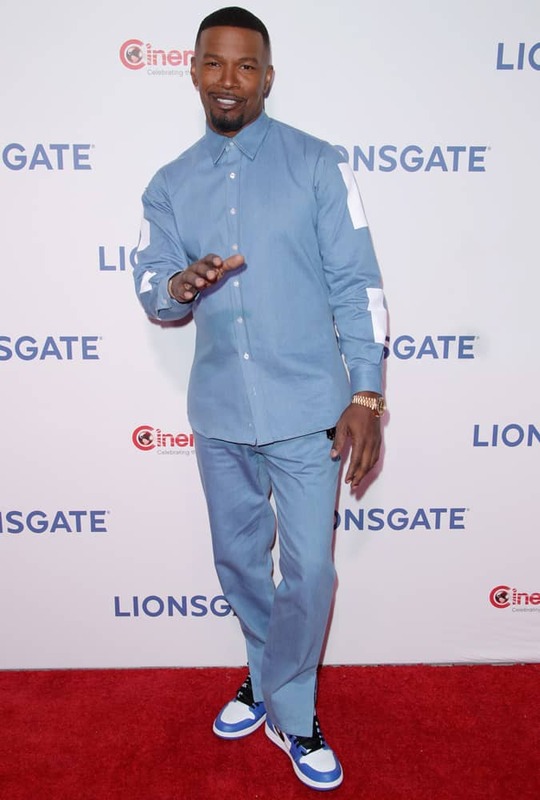 And then there’s Jamie Foxx, stepping forth in a whirlwind of charisma, with a matching sky blue shirt-trouser combo, with blocks of white up the sleeve and trainers so chunky Goliath would likely use them as a doorstep. And yet, it works. The whole look is like a futuristic boiler suit. Whether anyone else could pull this off is another thing. A lot of A-listers dress down for the airport, but Usher takes a different approach, mainly by looking like he’s rocking up to Berghain (only with more lax security). The satin bomber jacket has been cool since Drive, but it’s always going to be a statement you want to pare back – Usher keeps it simple with muted black pieces. Just follow his lead and not Kanye’s. ‘Binman chic’ won’t get you into the nightclub. Trust the ever-stylish Johannes Huebl to steal the limelight at a fashion party wearing nothing more than some distressed jeans and a blazer with the collar up. As Mr Porter unveiled its capsule collection with fashion heavyweights Prada, Huebl balanced the dark look with some could-I-care-less white sneakers. Sometimes simple wins. Singer-songwriter Ne-Yo’s biggest hit was the song ‘So Sick’, a ballad about a character who is sick of hearing love songs. You know, a bit like you were of the song ‘So Sick’ in 2005. Anyway, that’s enough battering the music. Let’s admire the genius of pulling off a fedora with jeans. The seemingly impossible is achieved by keeping the outfit sleek, shoelaces brighter than white and the roguish swagger of that leather jacket. If you hadn’t already clocked it, there’s an abundance of black and blue in this week’s line-up, proof that staple shades are your wardrobe’s hardest workers. That doesn’t mean they have to be boring, though. 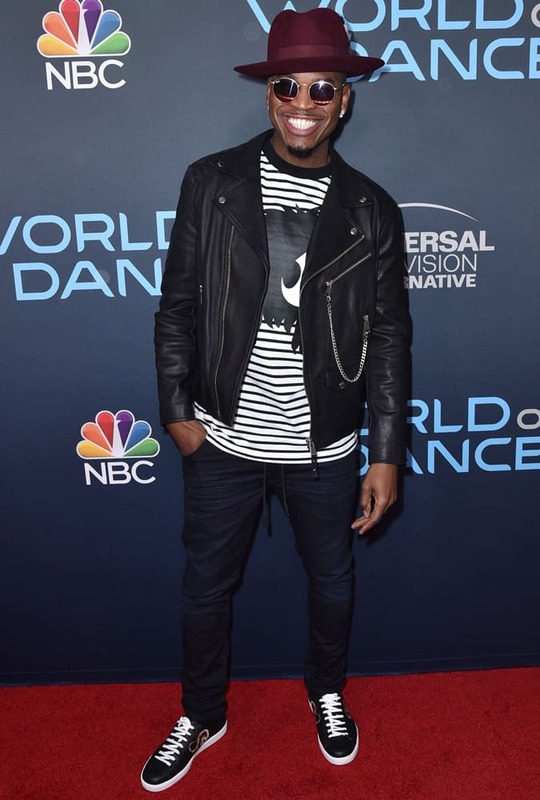 Take Derek Hough’s pyjama-style shirt with contrast piping matched by the similar white sneaker tread on his black brogues. See, monochrome needn’t mean mundane. And breathe. The bruising amount of black and blue is over, finito. Let’s admire the colour of passion, fury and lust as sported by all-around nice chap Andrew Garfield. It’s not a fiery red, more of a cautious claret on a menswear staple, the bomber jacket, matched with relaxed brown chinos and laid-back Derbies. This is how you do easy smart casual; considered but not over-thought. Hypebeast steampunk or futuro pied piper… there are a million ways to describe Lewis Hamilton’s dress sense, none of which you should ever take after. But recently the style confusion has parted. There are still hints at the F1 champ’s previous flamboyance, but it’s been tapered back. Case in point is this glittery, floral blouson cropped just above the hip, toned down by the black trousers. The metallic watch strap also works well with the silver on the flowers, as does the jumper. It’s a work in progress but at least he’s still not going after ‘sheikh chic’.